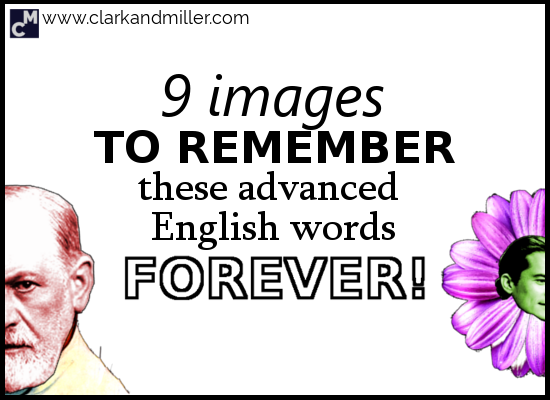 I showed you how to remember English rules with these 11 little drawings. Today, I’m going to show you how to remember English words forever (I hope!) using a special memory technique. Enjoy! How many times do you need to see a new English word before you really remember it? Research shows that you usually need to see a word up to 8 times before you remember it. Sometimes more. That’s not very efficient, is it? Well, here I come with good news once again. The good news is that there are ways you can remember English words much faster. If you haven’t already downloaded it, you can get my free eBook, which explains this technique in more detail. But to summarise it, all you need to do is create an image in your head that helps you remember the new word. Today, I want to share some of my favourite ones with you. A flower blooms in spring. It’s the word we use when the flower opens up and shows its beauty to the world. It’s similar to “variety.” We use it to talk about a group of different versions of the same type of thing. For example, most clothes shops have a range of T-shirts for sale. They’re all T-shirts — they’re all the same thing, but some are red, some are yellow, some are tiny and some have a picture of Mr Bean on them for no reason whatsoever. When you pour a drink, you move it from one container to another — usually from a bottle to a glass. Well, think about a dinner party full of rich people. There are the rich people at the table. But who pours the drinks? Poor people of course! It means to bring together in a confused mess. Think about what happens to electrical cables when you leave them alone just for a day. You put them in the cupboard, and they’re fine and organised. Then you open the cupboard a day later. And they’re a mess. Completely tangled. Think about Tango — two dancers “mixing” their arms and legs together. Now think about very complicated Tango. There are two ways we can use this. For example, if someone steals your ID card, goes to the bank, takes all your money out and then spends it all on chocolate clocks, then they’ve committed fraud. We can also use “fraud” to talk about a person who tries to deceive people with fake claims or fake qualifications. Like the scientists who told us that smoking was healthy back in the 50s. Or the Nigerian prince who keeps emailing you asking for your bank details so he can give you millions of dollars. Think about the famous psychologist, Sigmund Freud. Imagine everything he wrote was complete nonsense. “Fraud,” “Freud.” They sound similar, right? Want more crime vocab? Click here. This can mean either lots of things coming together, or it can mean bringing lots of things together. Remember that it either means coming together or bringing things together? “To gather” sounds a bit like “together,” right? You want to gather things … um … together! The main meaning of smother is to kill someone by covering their mouth and nose so they can’t breathe anymore. When you smother someone, you show too much love for them. In fact, you show so much love for them, through hugging and kissing usually, that the only thing they want to do is run away. I often think about overloving grandmothers and their grandchildren trapped inside their massive hugs. We usually use this word for someone who is hoping to get a certain position — someone who is applying for a job or someone who is standing for election and hoping to become a minister. Did you ever fall off something or hit your head on something or get punched by someone? When your skin gets hit somehow, what colour does it turn? It goes purple, sometimes, right? That purple thing? That’s a bruise. He gets bruises in more or less every film he’s done, right? OK. Let’s check. How many words can you remember? Answer in the comments (no cheating!). Did you find this useful? Do you know any people (or reindeer) that might also benefit from this? Then BE AWESOME AND SHARE! Spread the knowledge! ⟵Ashamed or Embarrassed: Which One Should I Use? Excellent work — nice one! Now the next step is for you to go make your own images for new words. I’d love to know how well it works (and what kind of crazy images you create). Let me know! Thanks Jabbar. Glad to help! Ohh interesting tips . Very good job . Thank u so much. Very good lesson and the examples are excellent. Love the graphics as always . Thanks Ellen. I’m glad you enjoyed it! How soon will the bloom smother all that gloom and doom? Can you arrange the colours of the rainbow in order? “Pour me some more!”, said Edgar Alan Poe. They’re gathering round to untangle The Gordian knot. Not only Sigmund Freud would be greatly annoyed if the rhyme was such fraud. Poor candidate ended up with a fool’s mate. Tattoos are not a bruise. I’m glad you like it, thank YOU for the inspiring post(s). The fisherman drawingsof yours are very helpful indeed. Thank you very much for the advise. The visuals can really help, yes. When I was at school, I tried reading and reading more but it was not efficient for me. When I told this to my English teacher, he told me to try new things, like writing, moving while learning, listening, etc. I tried different ways and I found that I can learn best when I hear the new vocabulary. Since than, I speak new words loud to memorise. I mean that every person is different. I will certainly follow your advise and use it for my new vocabulary. I will let you know how it goes. It was really great for me because I am studying English for IELTS exam and I really need a good way to memorize words. For those who are in a situation like me I wanna to share my experience. Among all application I had, there is an app which it’s really useful. I can memorize and learn a large number of words with a little fun. Called “WordUp”. I wanna strongly recommend to use it. This app will help you to learn words and realize when or where you need them to use. You can learn the root of each word, synonyms and all conditions of a word! Thanks for the recommendation. It looks great!